Last night’s Soyuz launch to the ISS with Karen Nyberg, Luca Parmitano and Fyodor Yurchikhin has made a new record, taking only 5 hours and 39 minutes from rocket ignition to the station. It was only the second time the faster launch method has been tried with astronauts on board, but it was a full success and the three new crewmembers did not have to endure nearly two days in the cramped Soyuz spacecraft like before. Now the ISS is again fully crewed with six people – the two NASA astronauts Karen Nyberg and Chris Cassidy, ESA astronaut Luca Parmitano and the three russian cosmonauts Pavel Vinogradov, Alexander Misurkin and Fyodor Yurchikhin. The star, so to speak, of the ISS Expedition 36 is Volare, the fifth long-term ESA mission to the station with italian astronaut Luca Parmitano. He is one of the newest and youngest astronauts inhabiting the space station – the former italian airforce pilot had only been selected in 2009 for a group of astronauts called The Shenanigans and his mission is his very first space flight. Both Karen Nyberg and Fyodor Yurchikhin have been in space before, the russian cosmonaut was even part of a long-term ISS mission in 2010. • The launch from last evening – there’s also the complete ESA coverage. 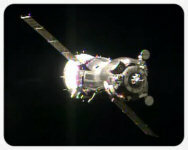 • Approach & docking – spectacular views of the Soyuz at the station! • Hatch opening, welcome and press conference – a really warm and even funny welcome. Apart from the “official” channels, there’s also the ESA blog of Luca Parmitano’s Volare mission, where he also often writes himself. He’s also on twitter as @Astro_Luca as is Karen Nyberg as @AstroKarenN, who has already written a short first tweet from space – and I’m sure that Luca Parmitano will follow soon. It’s going to be very busy on the ISS soon, not only because of all the science experiments – the station is going to be a real spaceport with ESA’s ATV transporter Albert Einstein arriving on 15 June, the first flight of Orbital Sciences’ Cygnus 1 following later that month and the Japanese HTV-4 and a Russian Progress freighter coming in August. The next Dragon transporter from Space X will fly in December and there will also be a whole new station block, the Russian Nauka Multipurpose Laboratory Module added to the ISS at the end of the year. Of course I totally forgot that today is Towel Day, the annual celebration of all things Douglas Adams and Hitchhiker’s Guide to the Galaxy. I usually put up some related reviews over on DVDLog, but I haven’t had a chance to translate the articles to English yet, so I’ll give it a pass this year. But because I like the radio series most of all Hitchhiker-incarnations, heres an amazing trailer for the stage version of the original cast! Bonus: another different trailer. Now there are some hoopy froods who know where their towels are! On Monday, three astronauts, Chris Hadfield, Tom Marshburn and Roman Romanenko returned from their half-year-stay on the International Space Station. While two of them were and still are Twitter users, it was especially Canadian Chris Hadfield who had really made internet history by not only sending daily images of earth from space, but also engaging in active social media outreach by filming videos, making music and giving lots and lots of interviews. 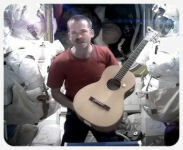 His farewell gift from orbit, a wonderful cover version of David Bowie’s Space Oddity, has accumulated over 13 million views on the original Youtube video alone. What is even more amazing about his work is that he did it not as part of an orchestrated media campaign, but in his free time mostly all by himself and with the help of his son Evan. It took a Canadian astronaut aboard the International Space Station to bring human spaceflight back into public awareness – not because he was told to, but because it was his personal choice. Chris Hadfield had actually been up in space two times before – in 1995 he flew with STS-74 to the russian space station Mir and six years later in 2001 he was part of the STS-100 mission to the new ISS, performing two spacewalks with his NASA colleague Scott Parazynski to install the Canadarm2 on the station. He was the first Canadian astronaut to walk in space – but these missions were only eight and eleven days long. His next spaceflight to his long-duration mission on the ISS came more than ten years later and gave him the opportunity to do what had not been possible before on his earlier missions due to time constraints – to share his incredible experience with the world. It’s fortunate that his time in space coincided with the emergence of social media, only five years ago all his efforts may not have been possible in this way. Since the one half of Expedition 35 has come back to earth, there has been virtual radio silence to the public from the ISS. No more Twitter, Facebook or Google+ postings, no direct words from the astronauts themselves apart from a recent hangout with the actors of the new Star Trek movie. 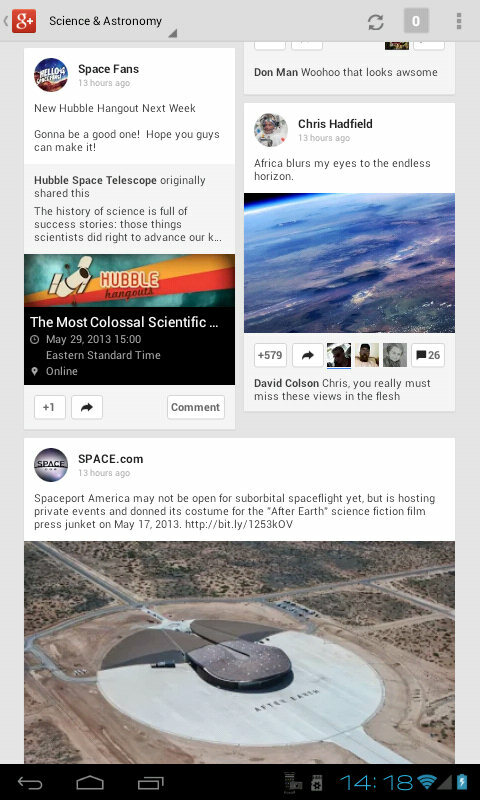 So why isn’t NASA stepping up to continue the wonderful outreach work of Chris Hadfield? There was a short artice in the Washington Post yesterday about this question and the answer was not altogether surprising: the NASA astronauts might not be allowed the same freedom Chris Hadfield has at the Canadian Space Agency, or at least they’re afraid that their activities in their free time might be seen as a misuse of government funds. With the sequester going on in Washington and NASA putting most of its education and outreach activities on the shelf, it’s completely understandable that most NASA personnel, maybe even including the astronauts themselves are not in a position to do much at the moment… but it’s a sad situation nevertheless. But there is hope: both Karen L. Nyberg and Luca Parmitano, who are launching to the ISS on May 28th are active Twitter users and even now are busy tweeting about the launch preparations. And Chris Hadfield has also not gone silent after the landing – he is still reporting about his recovery process on earth and yesterday mentioned that he still has thousands of unreleased photos left which he is going to share daily. The adventure is still continuing…! 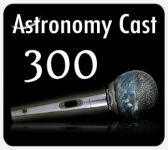 On Monday, Pamela Gay and Fraser Cain recorded the 300th episode of Astronomy Cast – an amazing and wonderful achievement of bringing scientific knowledge to just about everbody. They have been producing the podcast since September 2006 and have covered about every imaginable topic remotely connected to astronomy, but thanks to the scientific universe not being constant, there are still lots of new things to talk about and many older topics to revisit. Also amazing is that Astronomy Cast has spawned into a video podcast since the beginning of 2012 and every episode is recorded as a live hangout before it gets edited into an audio podcast, allowing the listeners to watch how the show is being made. At the moment, there are 293 audio podcasts available on the website while editing is catching up with the actually recorded episodes. In addition, the latest 55 episodes are also available as video podcasts with an additional half hour where Pamela Gay and Fraser Cain answer questions from comments on the web. Shows 245-247 are available in this playlist (created by me), 248-300 are in the official playlist. 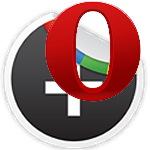 The hangouts of the live recording usually happen every Monday at 21:00 CET and the best method to be notified when a hangout is coming is to circle +Astronomy Cast and +CosmoQuest on Google+. So, why is Astronomy Cast so interesting? It’s not a dry and academic lecture, but the way Pamela Gay and Fraser Cain explain science is also not dumbed down at all, just enough simplified to make everything understandable for non-scientists. Some basic knowledge is, of course. required, as is at least some curiosity about the general subject itself, but their casual and friendly style makes the podcast very approachable, easy to listen to and often even really fun and entertaining. The sheer amount of episodes in the archive may be intimidating for first-time listeners, but the great variety of themes allows for a wide choice and while there is no need to listen to every single episode, I would neverteless recommend it. So, happy anniversary, Astronomy Cast! May there be at least 300 more episodes in the future – you’ve been and will be an invaluable source of knowledge. 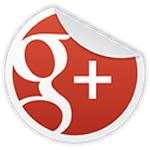 Celebrate by listening or watching an episode or two, circle them on Google+ and leave them a nice comment!